Vendor Portal provides configuration settings for SMTP connections, report viewing and general configuration. A detailed outline of these options are found below. 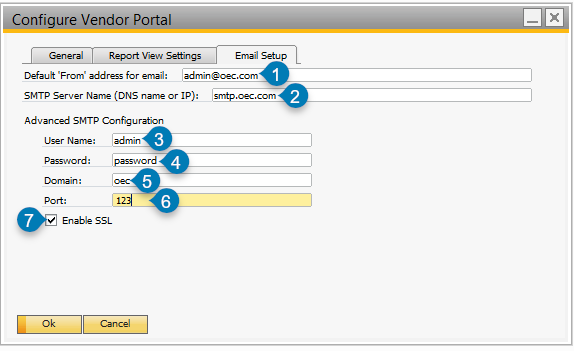 Vendor Portal configuration settings are accessible in SAP Business One using InterConnect Manager Add-On. Start the add-on and navigate to: InterConnect Manager AddOn > Administration > Vendor Portal Config. Vendor Portal Configuration - General tab, as described below. Allow Users to reset their Passwords (1) If enabled, this setting will display a link on the main login page. This link will allow Vendor Portal users to send a password reset email to their email address, provided the user is enabled for web login. Vendor Portal Web Address (2) When this field is set to the Vendor Portal website address, it allows the configuration screen to recycle the Vendor Portal application pools when changes are made to the settings. 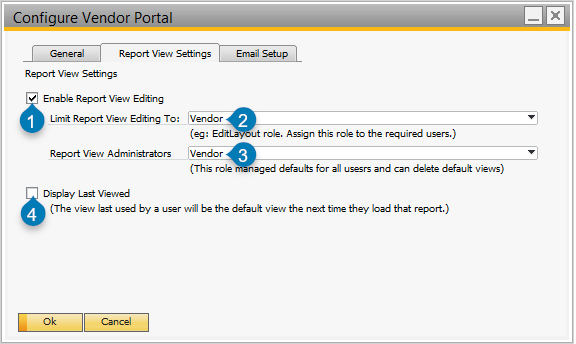 Vendor Portal Configuration - Report View Settings tab, as described below. Enable Report View Editing (1) When enabled, this option allows users with the specified role to edit their own saved report views. The role is configured in the Limit Report View Editing To drop-down (2). Administrators may set global views; This optional setting is assigned to the role set in Report View Administrators (3). Display Last Viewed (4) When enabled, this option allows users to automatically see their last manually configured and saved report view instead of the default report view. 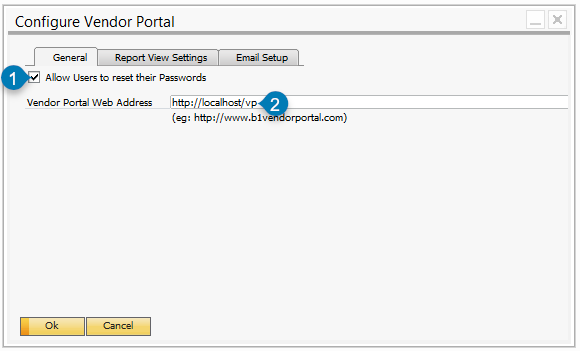 Vendor Portal Configuration - Email Setup tab, as described below. Default ‘From’ address for email (1) This is the “From” address used on all outgoing emails. SMTP Server Name (DNS name or IP) (2) If specified, this indicates an SMTP server which will be used for sending emails. Advanced SMTP Configuration (3, 4, 5, 6, 7) These fields can be filled in to connect to the SMTP Server (defined above the advanced settings). Ensure that Enable SSL is only enabled if required. This information will be provided by your SMTP server administrator.